Here you will find a tutorial on how to crochet the beautiful stitch pattern as shown. You’ll also find a pattern to crochet the scarf. Furthermore, the pattern provides you with a stitch multiple, so you can easily crochet an afghan or anything else that you like simply by increasing/decreasing your beginning chains. 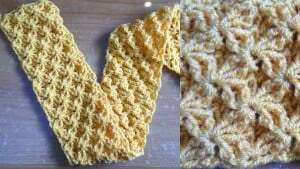 To crochet the scarf as shown, you will need a worsted weight yarn and an H crochet hook.